Fall flavors of cranberries, walnuts, ginger, and cinnamon complement the sweet spicy Bosc pear. 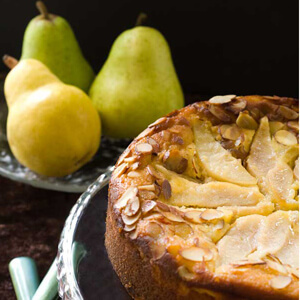 Perfect for baking, Bosc pears hold their elegant shape. Spread the walnuts on a baking sheet and toast in the oven until fragrant, about 5 minutes. Remove from the oven and let cool. Cut each pear lengthwise, scoop out the core with a melon baller, and expand the opening to about 1 ½ inches. In a small bowl, blend the brown sugar, butter, and cinnamon. Mix in the walnuts, cranberries, and ginger. Spoon the filling into the centers of the pears. Place the filled pears in a baking pan just large enough to hold them snugly. In a small bowl whisk together the honey, water, and lemon juice. Pour around the pears in the baking dish. Bake until the pears are tender when pierced, about 30 minutes. Remove from the oven, let cool and serve with the pan juices.